The name says it all. The TrueSmoke Standard Starter Kit is designed for first-time vapers. However, although the kit contains a high-quality eGo vaporizer and all the things anyone would need to start vaping, TrueSmoke could be selling the product short. The vaporizer has an elegant look that even the most seasoned of vapers may appreciate and the zip case is a nice touch. It’s compact enough to fit into a the top pocket of a shirt, or inside a handbag, and many vapers may find it useful to have all of their vaping gear together in one place. Of course, a portable vaping kit, though handy, is not going to be to everyone’s taste. Some people prefer to charge their vaporizer, top it up with e-liquid, and then pop it into their pocket or bag. The Having said that the TrueSmoke Standard Starter Kit is a perfect choice for any first-time, or light to moderate vaper, who wants to make sure they have everything with them and don’t want to risk turning up at work with an empty, or near-empty, vaporizer they cannot top-up. Nobody’s saying the TrueSmoke Standard Starter Kit the best choice for everyone. Clearly it is not. Experienced vapers who like to enjoy vaping more often, or desire a more powerful throat hit, will need a vaporizer that holds more e-liquid and has a longer battery life. But, for anyone who has light to moderate vaping needs, the TrueSmoke Standard Starter Kit takes some beating and it could be a perfect choice for a gift. The TrueSmoke brand is owned by BUYYO LTD and, although TrueSmoke appears to be particularly interested in targeting customers in the UK, BUYO is based in Cyprus. It’s a big company that is also responsible for developing and distributing the hugely successful PhenQ diet pill. The company has a good reputation for producing quality products and does not appear on any of the internet customer complaint boards. However, although the TrueSmoke Standard Starter Kit sales page states customers can have the e-liquid flavour of their choosing the choice is somewhat limited. At the time of this review the only flavour options offered were banana, cola, skittles, pure tobacco, menthol, and cola. The nicotine strengths offered were 0mg, 12mg, and 18mg. At the time of this review the TrueSmoke e-liquids sales page provided customers with 59 flavour choices, so the fact that anyone buying the TrueSmoke Standard Starter Kit can only choose from six is a little disappointing. However, the TrueSmoke Standard Starter Kit sales page provides the offered flavours option in a drop-down menu that would be incapable of providing such a vast amount of e-liquid flavour choices. So the limitation is not without good reason and most customers should be able to find something suitable from the flavour options available. It is possible to regulate the battery power to deliver more or less nicotine. The transparent cartomizer is easy to clean and makes it easy to see when e-liquid levels are getting low. Is the TrueSmoke Standard Starter Kit Good Value for Money? At the time of this review the price of the TrueSmoke Standard Starter KIt was similar to the cost of 40 Camel cigarettes. This is very reasonable price for a vaping product of this quality. The TrueSmoke Standard Starter Kit used to exclusive to the TrueSmoke website. However, sometime after this review was written the site vanished from the net. We can only presume Truesmoke has ceased trading. The TrueSmoke Standard Starter Kit was a quality item produced by a reputable manufacturer and it appeared to a perfect choice for people who are new to vaping or have light to moderate vaping needs. We like the fact that customers had so many colours to choose from and the zip case was a nice touch. However, the Discoball Vaporizer eGo CE4 starter kit is a better option and customers get two vaporizers for the price of one. 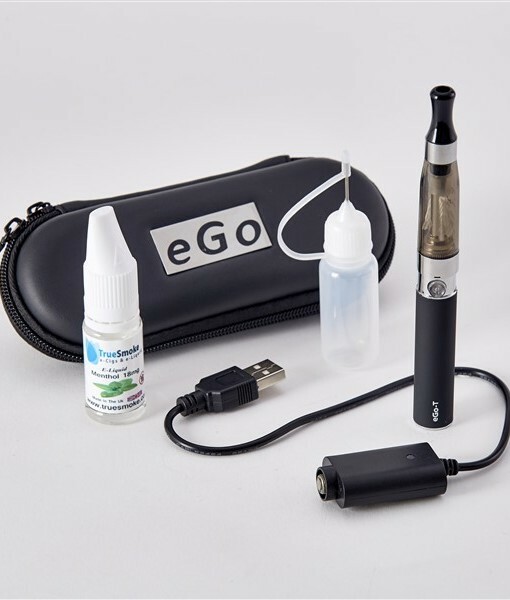 The kit also comes complete with a zipped case that’s similar to, if not a little nicer, than the one that Truesmoke used to supply with their starter kit. In all honesty, Discoball’s kit is a superior option all around. It costs a lot less than the one Truesmoke used to offer and we are happy to recommend it to anyone who is looking for a good first time vaping device or a unit capable of giving a good mouth to lung vaping experience.